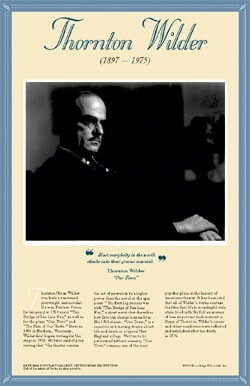 This unique educational poster of writer Thornton Wilder features a striking photo of him, as well as a quote from "Our Town," and concise biographical text summarizing his life and career. 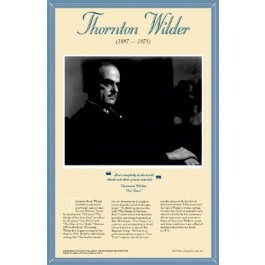 Thornton Wilder was both a renowned playwright and novelist. he won Pulizter Prizes for his 1927 novel "The Bridge of San Luis Rey," as well as for the plays "Our Town," and "The Skin of Our Teeth." "Our Town" remains one of the most popular plays in the history of American theater. This poster is a great way to introduce students to this great American writer.